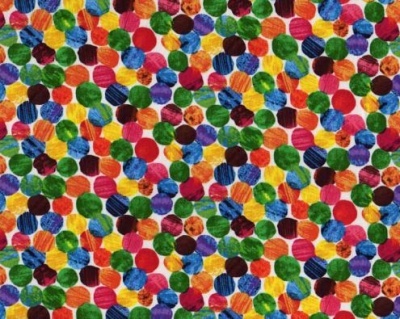 Very Hungry Caterpillar spot fabric, 100% cotton from the Makower cotton collection. 112cm / 44" Width, this fabric weighs approximately 150gsm. Multiples of a size will be cut as one piece unless requested otherwise. Vibrant, colourful fabric which I am using to bind a quilt and to make nursery bunting. Really good quality fabric with strong and vibrant colours. As always, delivered super quick too!